Germany's Foreign Minister Sigmar Gabriel branded Erdogan's comments shocking. Germany angrily warned Turkey on Sunday that President Recep Tayyip Erdogan had gone too far after he accused Chancellor Angela Merkel of using "Nazi measures" in an escalating diplomatic feud. 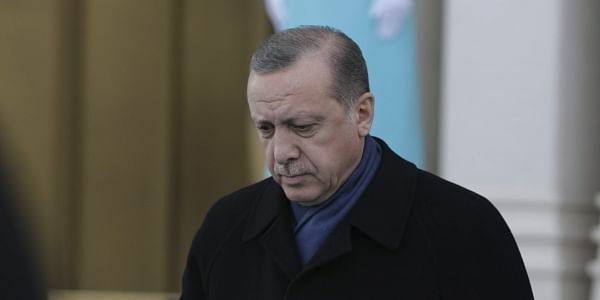 Turkey and the European Union are locked in an explosive crisis that threatens to jeopardise Ankara's bid to join the bloc, as tensions rise ahead of an April 16 referendum on expanding Erdogan's powers. The row erupted after authorities in Germany and other EU states refused to allow some Turkish ministers to campaign for a 'yes' vote on their soil, provoking a volcanic response from the Turkish strongman who said the spirit of Nazi Germany was rampant in Europe. "When we call them Nazis they (Europe) get uncomfortable. They rally together in solidarity. Especially Merkel," Erdogan said in a televised speech on Sunday. "Against who? My Turkish brother citizens in Germany and brother ministers" who planned to hold campaign rallies for a 'yes' vote in the referendum, he said. Germany's Foreign Minister Sigmar Gabriel branded Erdogan's comments "shocking". "We are tolerant but we're not stupid," he told the Passauer Neue Presse newspaper. "That's why I have let my Turkish counterpart know very clearly that a boundary has been crossed here." Julia Kloeckner, the vice-president of Merkel's CDU party, also reacted angrily to the comments. Home to 1.4 million Turkish voters, Germany hosts the world's largest Turkish diaspora but the partnership between NATO allies Ankara and Berlin has been ripped to shreds by the current crisis. Turkey reacted furiously to a Frankfurt rally on Saturday urging a 'no' vote where protesters brandished insignia of outlawed Kurdish rebels, accusing Germany of double standards. "Yesterday (Saturday), Germany put its name under another scandal," presidential spokesman Ibrahim Kalin told CNN-Turk. He said the German ambassador had been summoned although this was not confirmed by Berlin. The Turkish foreign ministry accused the German authorities "of the worst example of double standards" for allowing the pro-Kurdish protest while preventing Turkish ministers from campaigning there. Many protesters carried symbols of the Kurdistan Workers' Party (PKK), listed as a terror organisation not just by Turkey but also the EU and the United States. Ankara also reacted with indignation after Germany's intelligence chief said he was unconvinced by Turkish assertions that US-based Islamic preacher Fethullah Gulen was behind the failed July coup aimed at overthrowing Erdogan. Kalin said Europe was seeking to "whitewash" Gulen's group, while Defence Minister Fikri Isik said the comments raised questions about whether Berlin itself was involved in the putsch. "The fact that the head of German intelligence made such a statement will increase doubts about Germany and give rise to the question 'was German intelligence behind the coup? '," he said. In an interview with Der Spiegel published Saturday, German foreign intelligence chief Bruno Kahl said Ankara had repeatedly tried to persuade Berlin that Gulen was behind the coup "but they have not succeeded". The dispute has left Turkey's ambition to join the EU -- a cornerstone of its policy for half a century -- hanging in the balance ahead of the referendum. Erdogan threw further oil on the fire Saturday by saying he believed parliament would, after the referendum, agree a bill to restore capital punishment which he would then sign. It was Erdogan's clearest warning yet that he could reverse the 2004 abolition of capital punishment, a pre-condition for joining the EU. European Commission chief Jean-Claude Juncker warned Sunday that any return of the death penalty in Turkey would be a "red line". And Gabriel told Der Spiegel: "We are further away than ever from Turkey's accession to the EU." The crisis is hitting Turkey's relations with key EU members and Turkish-Dutch ties hit an all-time low in the run-up to the March 15 election in the Netherlands. Erdogan last week even called on Turks living in Europe to have more children to tilt the demographic balance. Danish Foreign Minister Anders Samuelsen on Sunday said he was summoning the Turkish ambassador for an explanation after a report that dual nationals critical of Erdogan had been threatened.